The Dutch system of higher education enjoys a worldwide reputation for high quality. Experience shows that people who have studied at a Dutch higher education institution perform very well in other parts of the world. 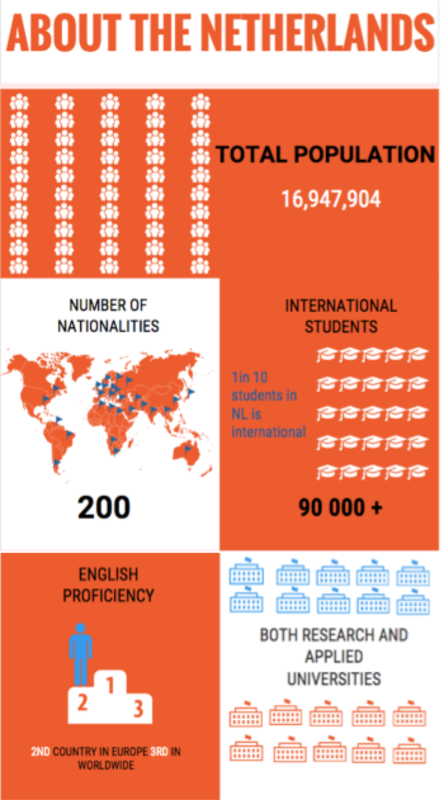 In addition, the Netherlands was the first non-English-speaking country to offer courses taught in English. The Netherlands has two main types of higher education institutions: universities and universities of applied sciences. Universities focus on the independent practice of research-oriented work in an academic or professional setting. Universities of applied sci ences are more practically oriented, preparing students directly for specific careers. How to finance your studies in the Netherlands? • You can take a tuition fee loan (approx. €1900). • Average student salary in the Netherlands is €7 per hour. • Average rent for accommodation is around €350 per month. • Average living cost in the Netherlands besides accommodation is around €300-400. • Working for 56 hours per month gives you the opportunity to get governmental support for €378, the exact amount depends on your parents income. Plus you can take a student loan.